Thomas has been inspired by Musikelectronic Geithain - Studio Reference Monitor Loudspeakers	with cardioid radiation characteristic. 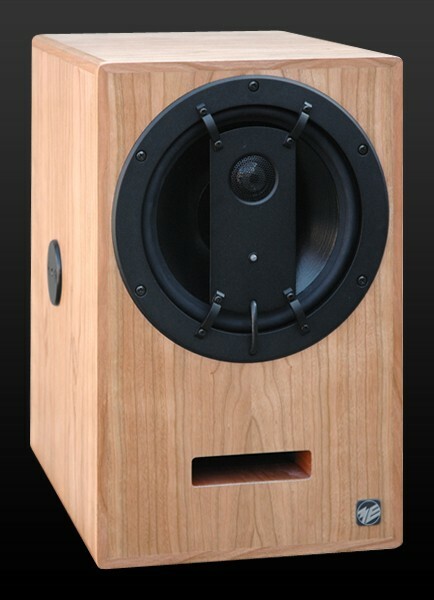 Thomas has also implemented the asymmetrical coaxial driver arrangement in mid and tweeter. 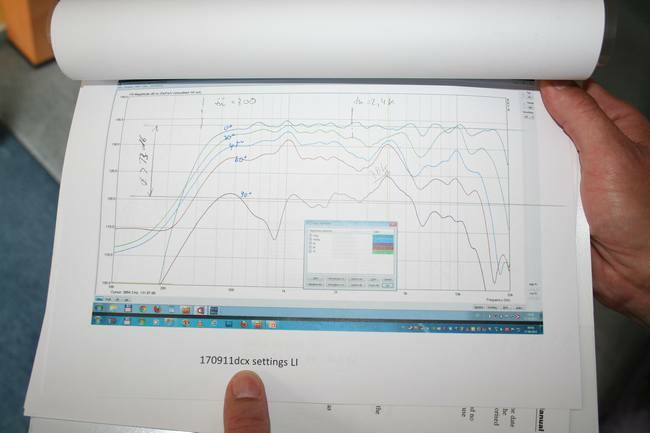 The mid is actually dual driver dipole arrangement to control the directivity pattern. 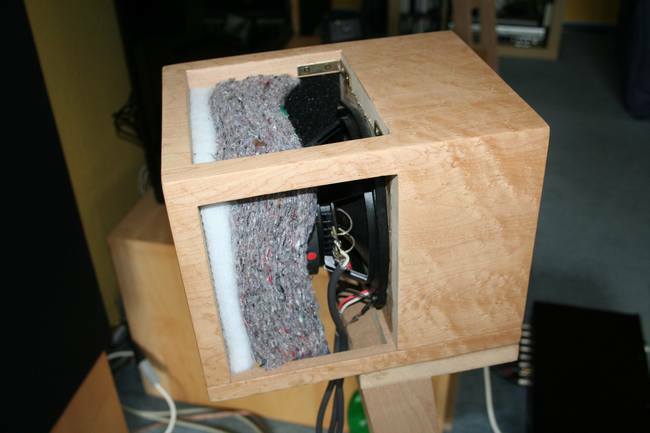 My inspiration to build a loudspeaker system this way, was by a member called AH on a German Hi-Fi Forum, who talked about the importance of dissipation, diffuse field, HRTF and so on ( I heard about this things for the first time ). I decided to aim for a cardioid dissipation in the mid to reach a uniform directivity from about 300 Hz to 10kHz. (below 300 Hz the ear can not very good differentiate between direct and indirect sound, about 10kHz happens nothing important in music for me. In my opinion, it's important to reach a constant sound level curve on the listening position without to do major changes in the linear free field curve. My target was a difference between free-field measurement and listening position measurements, with the same EQ, from about +/- 2 db. 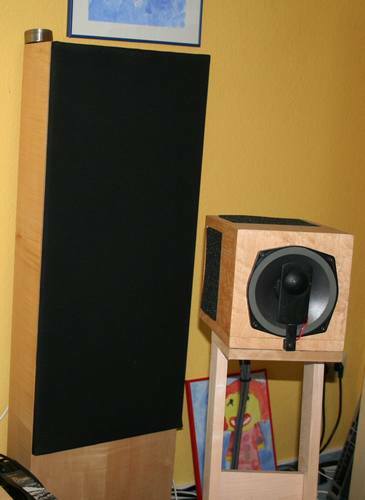 There is a German Firma called MEG Geithain which build loudspeaker systems like MEG RL 901K , RL 800 k with strong considerations about even dissipation. 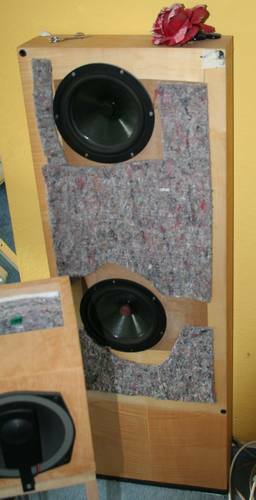 These loudspeakers are often used in German broadcasting facilities. The RL 800K uses an interesting principle to reach cardioid dissipation by using the rear sound of the mid speaker with a mechanic delay element to get the cardioid dissipation. After a long time of considerations and research in the internet, I decided to build this principle with 2 PA midrange drivers from PHL and the DCN 28 (the only digital crossover I know of with 8 output channels). This setup makes it possible to influence all parameter like frequency response, delay, x-over points on the 2 mid speaker to reach the dissipation I want. Another good reason for choosing DCN28 is the very convenient delayed 4 trigger outputs that control my 2 power amplifiers RMB1066. NAS server -> Squeezebox Touch -> DCN 28 -> Power Amplifiers -> Loudspeakers. With a Logitech Harmony remote I can start listen music by just 1 click (very high WAF). 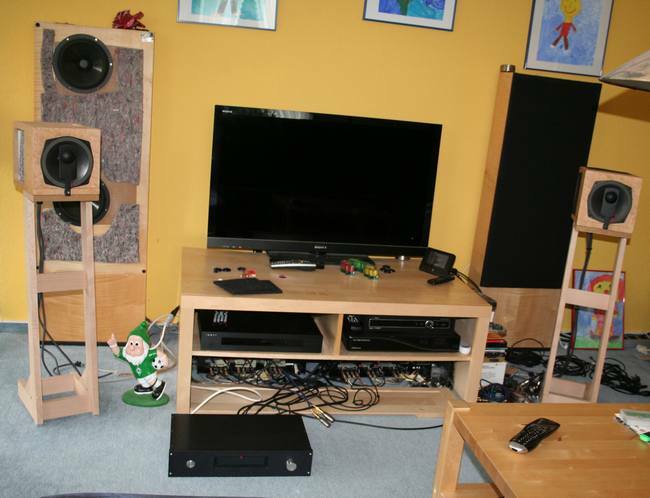 A view to the two Rotel 6-channel Power Amplifiers (6x60W), which is normally hidden away in the music rack.